Riding off of the Success of Wolfenstein: The New Order, Wolfenstein II: The New Colossus puts players back in control of B.J. Blazkowicz as he tackles the Nazi threat that is dominating the 1960’s. Expect adrenaline-fueled action in this brand new shooter from Machine Games as you will be wielding machineguns, rocket launchers, and even the infamous laserkraftwerk. Buy Wolfenstein The New Colossus from Green Man Gaming and join the resistance as America tries to take back their country from the Third Reich. In this alternate 1960’s timeline where Germany won the Second World War. Wolfenstein II The New Colossus on PC will also give you the opportunity to ride your very own fire-breathing Panzerhund. 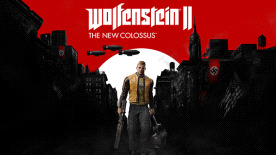 Please be advised that the international (non-German language) versions of “Wolfenstein® 2: The New Colossus” (the “Game”) includes Nazi-related symbols and content – as a result, the sale, import, export, or distribution of the international versions of the Game and its related images and assets to and in Germany is strictly forbidden by German law, and would be, among other statutory violations, a criminal offence which may result in a financial penalty or imprisonment. Any person involved and/or responsible for such violation may be prosecuted and sentenced, including officers and employees of companies involved. On the basis of legal advice and industry standard practice, ZeniMax are also not making such images or assets available to Austria.